Samsung has added to its S series range – S standing for style – with the S1070. This new camera comes with a 10.2MP sensor and 3x optical zoom and an 'intelligent' 2.7in LCD screen. Though this is a camera for those on a budget, Samsung hasn't scrimped on the features. 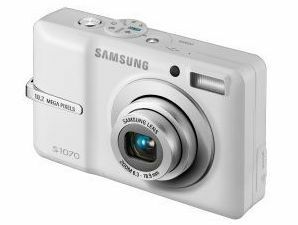 The S1070 includes: digital image stabilisation, face detection and a movie mode where you can pause and zoom while filming footage. ISO is also pretty decent, with the range going up to 1600 to help you tackle low-light conditions. Perfect for the camera user who doesn't want to muck around with pesky manual controls, the S1070 includes 10 screen modes. These are: Night, Portrait, Children, Landscape, Close-up, Sunset, Backlight, Fireworks and Beach & Snow. Number 10 is the aforementioned Movie mode. The S1070 will land in shops in September with a modest price of £99.